Hewlett-Packard said on Wednesday it is heading down its promised path of making webOS available to the open source community. 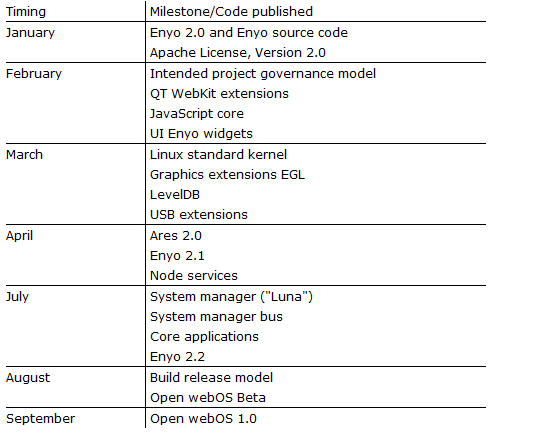 To start with, HP has released an updated, open source version of its Enyo developer tools and plans to deliver Open webOS by September. The company published a roadmap (see below) detailing its plans to release different components of the software, including key apps and its Linux kernel, over the coming months. “This is a decisive step toward meeting our goal of accelerating the platform’s development and ensuring that its benefits will be delivered to the entire ecosystem of Web applications,” newly minted Chief Strategy Officer Bill Veghte said in a statement. Of course, the big question now is how much interest there is outside HP in using the operating system.